Heat oil (2tbsp) in a pan. Add onion & garlic sauté till onion gets light brown. Keep stirring in between till water evaporates. Notes: Spinach leaves water so no need to add water. After water evaporates switch off the stove & let it cool. Add water in between to make fine paste. Note: Don’t add water at once; add it little by little as per the grinding requirements. Cut the paneer into small cubes and deep fry in hot oil until light brown on sides. Heat oil (3tbsp) in a pan. If possible use non stick pan. Add onion sauté till light brown. Add grinded spinach paste, stir & close the lid. When it starts boiling add garam masala, chilly powder & salt. Stir in between for 10mins. Add paneer stir & boil it for 2mins. Serve it with Indian breads. Note: The gravy spills while boiling so close lid & be careful while stirring. 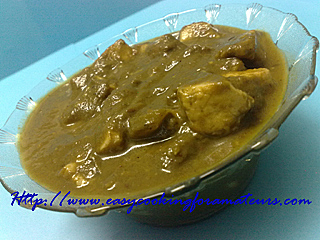 “ready to eat palak paneer"
hey palak paneer looks so delicious..tasty and favorite..